Do you have ideas for new inventions? Are you always looking for the next great invention idea? Fascinated with inventions stories of familiar products? Than this is the place for you! Read everything you ever wanted to know about inventing– coming up with your own invention or researching others. the ultimate free resource for turning your innovative ideas into products and for encouraging, accessible invention help. Are you an aspiring inventor? Have an invention idea but not sure what to do with it? 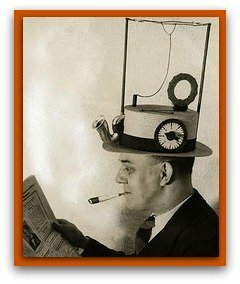 new invention, 1931: Portable radio in a straw hat. Our guide to the novice inventor, will take you through the steps and answer any question you might have on the process of inventing. The information on this site will help you pursue your creative (and commercial) dreams by making the process, from idea to product, as clear and accessible as possible. Check out the guide section, on the left, for everything from tips on how to find your own unique ideas for new products to step by step instructions on making them a reality. Struggling to find that one invention idea worth pursuing further? The new invention ideas section gives you tips and quick innovation techniques that are proven to help you come up with your own new inventions ideas, in no time. Already have an invention in mind but not sure what to do next? You can find everything you need to know on the invention process, from building a prototype to getting a patent. Is your confidence in you ability to really bring a successful product to the market wavering? Get inspired by success stories of inventors – people who started just like you and ended up with a real product on the market and often a new career. There is something so inspiring in reading others stories of success. I know when i lose faith in my ability to do something, discovering that other people, not much different than me were able to do it and succeed always manages to get me going once again. To make sure you dare follow your dreams, i also threw in some inspirational tips from successful inventors and other successful product entrepreneurs on what it takes to realize your success dreams. I have started this site to help others pursue their creative (and commercial) dreams by making the process of invention, from idea to product, as clear and accessible as possible. I hope it will become the ultimate free resource for turning your innovative ideas into products and for encouraging, accessible invention help. If there is anything you were hoping to find here, and couldn’t quite locate it, drop me a note and i will put it in the pipeline for new pages. Having tried my hand at inventing products as well as helped friends navigate what seems like a very technical and complicated field, i soon realized that the web could use a place that is accessible, simple and clear and tells you all you need to know , straight up. So my aim is to take you by the hand and show you how to make your idea a reality – step by step. It’s easy and simple and you can do it too! No technical high level wording that gets you confused and frankly, scared, rushing to pay an expert to clear up things you are not sure about. Nothing vague that seems complex when it actually isn’t. The beauty about many inventions stories is in their simplicity. Someone encounters a nagging problem, he comes up with a potential solution, tweaks and perfects it and brings it to market. Yes, it’s a process, and yes a lot of work is involved, and there is no guarantee you will succeed. But you are creating something new – what is more exciting than that? The inventions handbook is meant to be a source of information and guidance on everything related to inventions. Since i know for many, the fascinations with the process of creating new products and coming up with innovative solutions starts at an early age, i included a whole section targeting kids. Yes, children can be amazing inventors, all they need is someone to believe in their abilities and support their natural creativity. Whether you have a creative child in your life or you are a fledgling young inventor yourself, head over to the inventions for kids section and get inspired to come up with your own new product ideas. Read stories on how famous inventions came to the world , or just amuse yourself with some weird inventions whose claim to fame has more to do with their bizarreness or uselessness than their actual value. 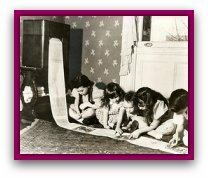 From historical inventions to inventions made by kids , this site will (eventually)provide every invention story you can think of. Anything you would like to see on this site, but cannot find? Tell me! I will do my best to put it up here, as soon as possible.